Salve Regina University is a university in Newport, Rhode Island. Founded by the Sisters of Mercy, the university is a Catholic, co-educational, private, non-profit institution chartered by the State of Rhode Island in 1934. Drupal Connect kicked off the project with an interview with the stakeholders that determined the right audiences and user stories. This eventually led to content type definition, various user roles and permission definition, and primary menu structure for the entire site. Drupal Connect's graphic design team worked very closely with Salve Regina University's team using the deliverables from the information architecture phase as a blueprint for how the layouts should be designed. 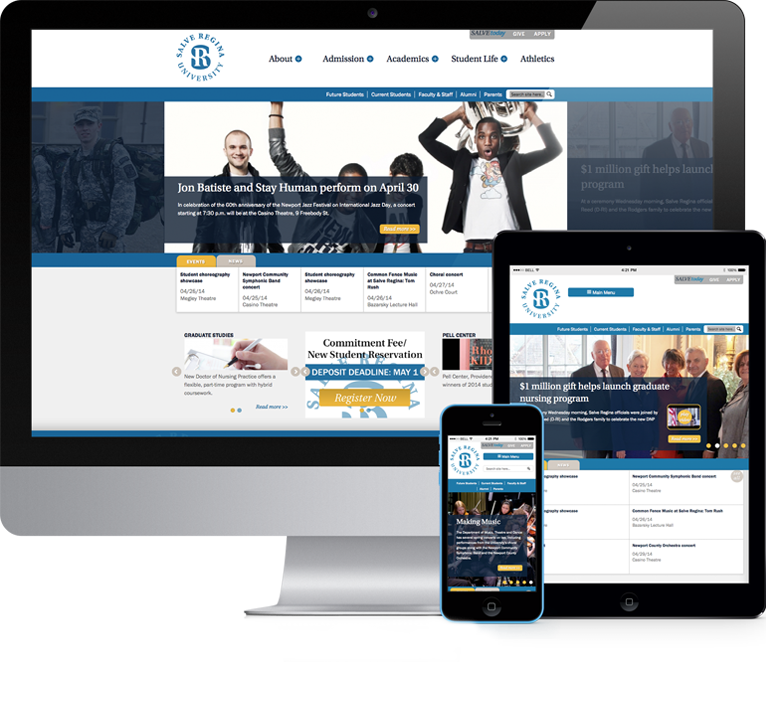 Drupal Connect completed a responsive design with 3 breakpoints for all of the types of layouts in the design. Drupal Connect entered into an iterative design process and Salve Regina University was particularly happy with the end result. Drupal Connect's expert themers then created a custom responsive theme in Drupal 7 that matched the deliverables of the design phase. Drupal Connect also used modules such as Quick Tabs, Responsive Menus, and MegaMenu to help accomplish this goal. Drupal Connect wrote some customized modules to pull in various feeds from Flickr, Youtube, Facebook, and Twitter and exposed the contents from various accounts into a custom heirarchical menu. Drupal Connect worked very closely with Salve Regina University's team to make decisions on what specific types of content should and should not need to be migrated into the new Drupal CMS. Some of the content needed to be curated and as a result, Drupal Connect used custom flags to tag the specific pieces of content that needed further review by Salve Regina University's team. Drupal Connect used the Feeds module to import most of the content with a custom helper module to handle the flagging of content for review. Drupal Connect also wrote a custom module to help with 301 redirects mapping old URL paths to the new Drupal URLs. Salve Regina University was delivered a fresh responsive theme and design, that improved content management efficiencies on Acquia's highly performant stack and workflow. Users had only the necessary permissions to be able to do exactly what their role allowed them to do for content entry. This also allowed CMS users the ability to allow other team members to contribute content to the new site because of the new permissions system that Drupal Connect put in place. Drupal Connect delivered a streamlined workflow process tailored to individual roles in a highly distributed solution.